Does your kid complain of stomach aches or head aches just before exams? Do they ‘go blank’ during exams? Do they score much less on exams compared to homework or non-test situations? It could well be a case of exam anxiety. Exam or test anxiety shows up in various ways. Nail biting and teeth grinding are quite common test anxiety symptoms. 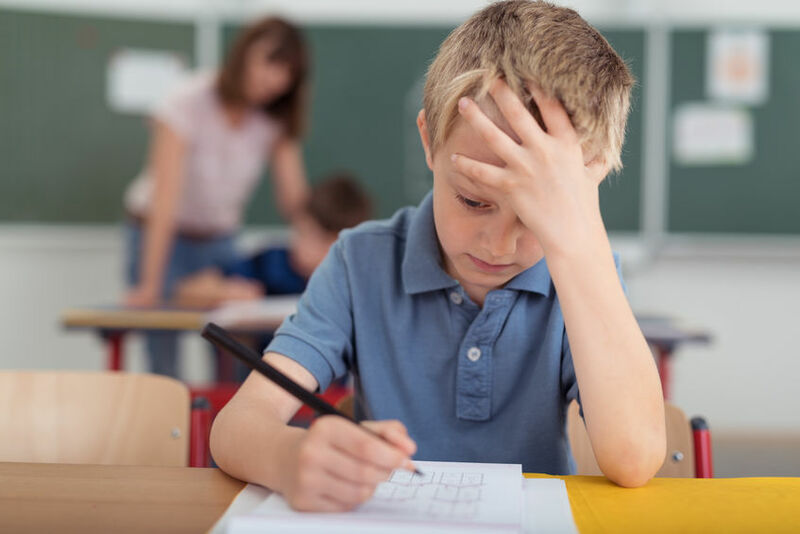 Other most common physical symptoms of test anxiety are headaches, diarrhea, nausea, and extreme body temperature changes. Depending on the severity of the anxiety, rapid heart beat and shortness of breath also may be experienced. The child could sweat a lot, and experience a dry mouth. In extreme cases, the child is not able to hold the pencil or pen with a stable hand. You can see the hand shivering trying to write on the exam paper! Panic and excessive fear are most common. Some children might fall into mild or moderate depression before an examination and feel helpless as to how to deal with it. Sometimes test anxiety manifests as uncontrollable crying or laughing, and disproportionate anger. Ever seen kids getting very restless during a stressful time? Fidgeting and pacing are common signs of test anxiety. They might get irritable and cranky. They may lie awake at night, unable to sleep or relax. Some children refuse to eat food during exam time. It is very common for students to make mistakes that they otherwise would not have made, due to overthinking and being too careful not to make mistakes. There could be intrusive thoughts which are negative in nature. The future might seem bleak. The child might repeatedly tell you that he/she is going to fail the exam, and then ask you what would happen? “Will you be angry with me? Will my friends laugh at me?” – these are common questions. Prepare well! Yes, if a child is well-prepared for an exam, doing revisions on time, and taking plenty of sample exam papers beforehand, there is no reason for anxiety. A parent’s or teacher’s job is to see that the child has enough preparation, so that his/her confidence in tackling the examination is high. It is very important to let children practice writing examinations, because writing answers to questions according to the rubrics within the allotted time is a skill in itself. Many parents make the mistake of expecting their children to ace all their exams, and openly show their displeasure if anything less than an A grade is on the paper. The message to get across is not to get an A grade, but to do the best he/she can. Instead of ‘Go, get an A grade’, we should start saying, “Go, do your best’. Burning the midnight oil the night before exams is common practice, but this is a detrimental practice for doing well in exams. Make sure that children sleep well and eat well during exam time. The brain needs the rest and nourishment. It is a wise parent who makes sure that the child has slept by 9 to 10 pm, during exam days in the case of adolescents and by 8 to 9 pm, in the case of smaller children. Some children find it extremely comforting and reassuring if the parents sit with them and spend time to help them to study. It could be as simple as just sitting with them as they study, or asking questions on the topics they have done revision on. It is also important to lend a listening ear to whatever feelings they want to put into words: feelings of worry, stress and perhaps inadequacy. You can reassure the child, saying that all you expect is him to do his best, and that your love for him will not become less even if he gets a bad grade. With the right coping mechanisms in place, exam anxiety ceases to be a worrisome problem!